Nui co-founder behind The Digital Vault and RevvCard? As I was doing my research for our article yesterday on Nui’s arguably pointless CompChain, I came across a corporate blog post that piqued my interest. You may have heard talk about something called The Digital Vault. Some are alluding that Nui is part of the project. We want to make it very clear that Nui is not associated in any way with the Digital Vault. It has never been one of our initiatives, and therefore we have no insight, visibility, or influence on it. Neither Nui corporate, nor Darren Olayan (CEO), Reid Tanaka (President), Jim Pare or Casey Combden (Keystone Leaders) are affiliated with or endorse the Digital Vault. If members wish to share information personally about the Digital Vault, they must not use any Nui-affiliated channels. Any posts on social media groups, pages, etc. that bear the Nui name or in any way imply that the Digital Vault is involved with Nui will be considered a compliance violation and subject to corporate action. I’d previously seen Digital Vault referenced in passing, but this sounded like it warranted a closer look. Seeing as Nui and their affiliates have had since at least March 11th to scrub the internet of Digital Vault marketing, info is scarce. Affiliates sign up through a referral link, which forms a separate downline outside of Nui. RevvCard is a debit card that Digital Vault affiliates can ‘load all of their cards, accounts, and so on onto‘. RevvCard works with fiat and Nui’s Kala altcoin, and Digital Vault is supposedly FDIC insured. A bank search on the FDIC website however turns up nothing for either “Digital Vault” or “RevvCard”. Nevertheless, Nui affiliates are claiming The Digital Vault bank accounts “will be 100% insured”. The Vault will have all banking services like checking, bill pay, debit card, loans, mortgages, etc. Signing up to The Digital Vault is free, so commissions are paid on merchant fees and monthly account fees. The Digital Vault affiliate membership fee is $60 and then $30 a month (first month is $30 for Nui affiliates). I believe this includes a RevvCard. The Digital Vault pays out commissions via a 3×10 matrix. up to 1% of generated transaction fees is split across the matrix. To qualify for the “revshare” transaction fees, a Digital Vault affiliate must recruit and maintain at least ten affiliates. So other than Nui affiliates being the only ones promoting The Digital Vault and RevvCard, and Kala being the only officially supported altcoin, where’s the concrete Nui link? The Vault is owned by Richard Smith and managed by a full executive team out of the Las Vegas, Nevada area. 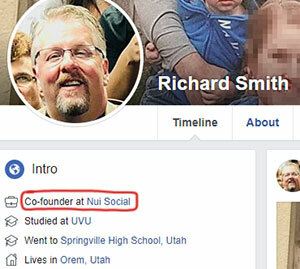 According to his personal Facebook profile, Richard Smith is one of Nui’s co-founders. Smith has been tied to Nui since it began as Divvee (the original company he co-founded), although in Nui he’s left Darren Olayan to be the face of the company. Further supporting Nui’s direct links with The Digital Vault are the use of Kala (which doesn’t exist outside of Nui), and $30 off the signup fee for Nui affiliates. Verifying Nui affiliate membership would require access to the Nui affiliate database, which is easy to obtain when you’re the co-founder of both companies. What we appear to have with The Digital Vault is another Mintage Mining setup. When it launched, Nui went to great lengths to pretend Mintage Mining was a separate company. That fell apart though apart after the state of Texas issued Nui with a securities fraud cease and desist, in part because of the mining opportunity offered through Mintage Mining. The Texas securities fraud cease and desist eventually resulted in Nui paying a $25,000 fine. Banking is obviously a strictly regulated industry. One in which MLM crypto cowboys running around pretending to be a bank probably aren’t going to last long in. Not withstanding Nui’s securities fraud fine, and the risk that brings to any financial channels the company integrates itself into via Digital Vault. Secondary regulatory concerns might pertain to The Digital Vault’s MLM opportunity, owing to the compensation plan being chain-recruitment based (sign up, pay a fee and get paid to recruit others who do the same). For now information pertaining to The Digital Vault and RevvCard is supposed to be hush-hush. Further details (mostly a rehash of the information above) is expected to be released later this upcoming week. To be clear there’s nothing inherently illegal with running a bank or a debit card attached to an non-public altcoin, provided you set everything up legally. That includes full disclosure to regulators and the public, which as far as I can see isn’t happening. In fact by virtue of Nui’s censorship crackdown, they’re clearly going in the opposite direction. Then there’s the public statement by Nui that it has nothing to do with The Digital Vault. Notably, Richard Smith’s name is omitted from the notice. But that doesn’t change the fact that Smith is running both companies, which through their respective MLM opportunities are integrated on multiple levels. So where’s this all going to end up? With Mintage Mining it was pretty clear Nui were committing securities fraud. Unfortunately though regulatory action against the company was limited to Texas. If the SEC are investigating at a federal level we aren’t aware of it. Banking regulation isn’t something I’m all that clued up on, owing to the fact it’s rare for an MLM company to stupidly run around marketing itself as a bank. We might have an update for you pending what information is made public later this upcoming week. Although from what I’ve seen, there’s not much more to The Digital Vault and RevvCard than I’ve put together above. But that doesn’t change the fact that Smith is running both companies. He is not. He stepped down and LEFT Nui long time ago – to work exclusively on Vault, specifically for the reasons you mentioned here. Nui and Vault are two entirely separate(!!) entities. Ye sure, Richard should update his FB-Profile. If you want to know what that card looks like, just google for “qmplete”. Olayan was only credited as a “managing member” of Nui in the Texas C&D. He wasn’t cited as an owner. …except that it has access to the Nui affiliate database, is only being promoted by Nui affiliates and is using Kala, a non-publicly traded cryptocurrency that doesn’t exist outside of Nui? And thats one of the less rediculous claims they make!!! A better question is why do they need a smart multi-card for this, i.e. a smart-card with a display and everything? A smart multi-card is for consolidating wallets, i.e. load multiple cards onto the same physical card. It has nothing to do with crypto. To save you the hour 20 of slightly nasal marketing blather I’ll give you some condensed impressions. The Revv card, which I believe is a white labeled Qmplete Card is an interesting project which sorta looked like it almost fizzled out last year. It must still have some life yet because JJ says the cards will be sold in Walmart later this year. People who buy the card (~$100)are users, members or customers and earn no rewards/commissions. Good so far. To become an affiliate you pay a $30 fee and $30/month thereafter. Now this is where the wheels fall off. Those fees are only paid by affiliates and because of that it should be classed similar to a sales aid and therefore should not be commissionable. But of course it is through a 3X10 forced matrix. And despite using a ten level deep pay plan JJ insists the Vault is not a MLM. After all no bank in the world will touch a MLM so he says. The Qmplete card isn’t a credit card in and of itself it lets you load and cards you do have and their fancy card let’s you choose which of your existing credit cards to swipe at a terminal. If Qmplete really will be sold through Walmart it will be very interesting to compare the fees charged by Vault and by Walmart because my best guess is that the way the Vault can pay (fractions) of swipe fees to the people who referred the customer is by jacking those fees a bit. The bank part, it’s just a normal bank account linked to the card but it kinda sounds like you have to open an account in a particular bank. Normal KYC, (fiat) deposits FDIC insured. The crypto aspect was so poorly explained that I don’t think even JJ understood it. There will be a multi coin wallet involved and it’s tied to the card somehow, most likely through a phone app. At present Kala only exists on Nui’s servers but as soon as it goes “public” it is claimed that you can buy or sell Kala “instantly.” I guess the card eliminates market forces in worthless shitcoins. All told the Vault is a combination of established technologies cobbled together to fit a sales pitch. None of it’s functions are new or even all that desirable of a combination. If they didn’t promise that this thing could (eventually, one day) turn Kala into cash I doubt there would be much buzz. And wait till we learn what the fees look like. So instead of just carrying around a few cards + phone, I can add a slab in my wallet that I need to pissfart around with a screen before I can use it. And it needs to be periodically recharged. And it’ll cost me at least $100. Swell. Did they address the “this has nothing to do with Nui” nonsense? First off you still need your phone. A phone app interacts with the card and even warns you if your card is ever more than 30 feet from your phone which is a somewhat useful if potentially annoying feature. And “we ain’t Nui” was touched on in several places. Again, the place of honor the Vault greats Kala sorta belies that notion. But honor among thieves, respect your Nui line of sponsorship when joining the Vault, wonder why they didn’t make this a “usecase” for CompChain. So if I forget my RevvCard when I leave the house (or my phone)… I have to spend time setting everything up again? I already use Google Pay so no idea why I’d need a separate electronic device to do the same thing. The only extra seems to be Kala integration, which is pointless because Kala has no value outside of Nui (and if they do get it listed on some dodgy exchange it’s just going to plummet to zero). I reckon they didn’t use COCO because that’d be #RIP for Kala, which Nui has spent considerable effort getting people to invest in with the usual lambo marketing. So now you have Nui pushing Kala and CompCoin, which will only cause further marketing confusion. Not that anyone outside of Nui is really paying attention. Well, except us and maybe the SEC. Seems like they are selling a dream. I would bet that they never get the card to market. I hope people don’t pre-order them with the $100. Why would Revvcard use this company to sell the card when people are saying Walmart will be selling them also. If the card is sold at Walmart, there is no revenue shared. If I was owner of Revvcard, I would only sell to Walmart and keep all the profit from fees. I don’t believe most of the things they are saying. They are trying to create credibility with saying Walmart is going to be selling them. I could be wrong, but I doubt I am. Be careful, I just heard that they are going to start collecting $35 a month per member before you can even order the card. Watch, there will be delays in getting the card, month after month. They have been talking about this card for over a month. Some folks have even said that the cards are already made, but yet know one can show the card, not even the owner Richard Smith. They keep saying it’s not MLM or multi level marketing because banks wouldn’t allow that. Come on people, it’s an MLM 3×10 matrix. I think this will fail and as I said on Mar 28th, I don’t think they will ever get a card. $35 per month is not a lot of money, but I believe a good way to collect money for the owners before they dump this thing. And by the way, it’s going right into NUI’s pocket. Don’t be fooled.